It’s a funny shrub, my hamamelis virginiana. The skinny branches arch up in an ungainly manner, reminding me of an awkward teenager. No longer a cute little kid and not yet a robust and fully developed adult. Even when it wears it’s spiderlike flowers it still manages to look out of place somehow. I suppose it is out of place here in my garden. This variety originates from North America as an under-story plant in great forests. It was a favourite of the Indian Nation. One of their trusted medicines quickly adopted and commercialised by the colonials. Becoming a staple as the essential ingredient in ‘Ponds’ cream. Back in the day I used witch hazel extract to cleanse and tone my skin. That’s all there was, and as a little girl I remember watching my mum apply ‘Ponds’ cream to her face every night. I don’t know if it was the ‘Ponds’ but her skin is wonderful and she still has hardly a wrinkle! One of the most appreciated attributes of this plant is it’s astringent activities, the bark being high in tannins. This makes it brilliant for healing and soothing haemorrhoids and varicose veins. It makes more sense to me now as I look at the long spindly branches, and clumps of strange flowers. It’s signature is there as clear as day for the observant eye. For more details read the full post. My Hamamelis virginiana pictured above is blooming at present. The branches are dotted with the unusual spider like flowers. Description; Witch hazel is a large woody deciduous shrub. It can grow from between 8 to 15 feet high with silver grey branches that arch from the base of the plant. The lettuce green, alder like leaves are alternate and coarsely toothed. The blooms appear during the winter on the naked spindly branches. The flowers are yellow and spidery with four long crumpled strap-like petals. They are produced in clusters and nestle in the axils of the leaves. The seeds ripen as the plant is in flower. The seed casings split open each throwing two shiny black oblong seeds to distances of up to 20 feet. Parts used; leaves, twigs and bark. The bark has a much higher concentration of tannins. Preparations; extracts/tinctures, tea, homeopathic remedies, creams, ointments, capsules, wipes, suppositories, poultices, douche, cosmetics, after-shave balm, toner. Habitat; Hamamelis virginiana is native to the eastern and mid-western United States and southern Canada. It thrives in the under-story of well-shaded forests with low to moderate soil moisture levels. It does however tolerate dry and sunny habitats. Traditional & Historical uses; Witch hazel is a traditional medicine of some Native American Tribes. The Osage, Potawatomi, Menomini, Iroquois and Mohegan peoples are on record to have used witch hazel for many different ailments including skin complaints such as sores, bites, cuts, ulcers and tumours. In a sweat lodge for sore muscles, as a tea for dysentry, indigestion, as a blood purifier and to regulate menstrual disorders. The plant was soon taken into use by the early colonists and incorporated into creams, lotions and medicaments. It was used for treating eye inflammations and diarrhoeas as well as all the before-mentioned complaints. The name witch comes from the old English word ‘wice’ meaning pliant or bendable. Their pliability is one of the reasons they were used as dowsing rods. The forked branches are still used to divine for water. Therapeutic Actions; astringent/styptic, haemostatic, tonic, anti-oxidant, anti-viral, anti-fungal, anti-inflammatory, sedative. Constituents; flavonoids; kaempferol & quercitin. Tannins; hamamelitannin, proanthocyanidins, gallic acid. Catechins, resin, choline, saponins, bitters, volatile oil. 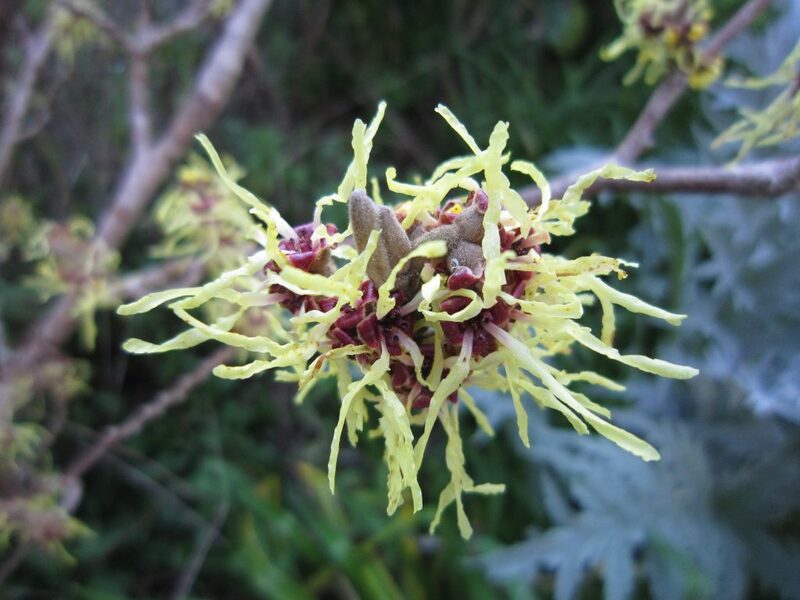 Medical uses; Witch-hazel is used in many ‘modern’ commercial preparations such as rectal suppositories, pad wipes and ointments for haemorrhoids. To date there have been no meaningful scientific studies done to verify the efficacy of this plant. Of course that doesn’t mean that it doesn’t work. It just means that the pharmaceutical companies are not interested right now. Lets be grateful! Current Herbal uses. Externally; Witch hazel is most commonly used as an astringent for toning and strengthening weakened or damaged blood vessels such as haemorrhoids/piles, varicose veins and spider veins. For relieving the itch and bleeding of haemorrhoids, as a douche for vaginitis and as a gargle for sore throats. For bruises, swellings, sunburn, cuts, wounds and the pain at the site of stitches after surgery. Used in acne preparations, for psoriasis and eczema, in cleansers, toners and moisturizers. Internally; make fresh herbal tea or over the counter capsules for diarrhoea and internal haemorrhoids. Contra-indications; in most of the literature we are advised not to use witch hazel as an internal treatment because of it’s strongly astringent properties. It is purported to potentially cause gastro-intestinal or hepatic damage. In Germany however, it is approved for the internal treatment of mild diarrhoea and inflammation of the gums and mouth. Food uses; the American Indian people of the south eat the seeds which are said to be similar in taste to the pistachio nut. Naturally by Trisha Products containing witch hazel; Pile-it-on Balm,, Mother’s Belly Balm. Forever Face Cream.